The “Every Pictures tells a Story” series reviews newspapers through a lens focused only on their pictures and captions. 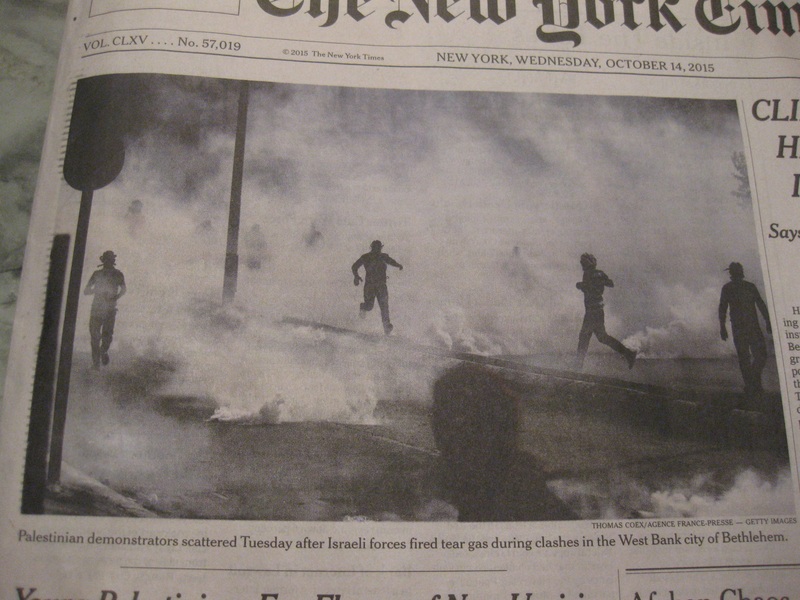 The brutal attacks that occurred in Israel during the week October 7-14 provide a good snapshot for how the New York Times viewed the conflict – the only victims in the Middle East are Palestinians. To set the background for the two weeks of violence: on October 1, 2015, Palestinians shot an Israeli couple who were driving on a road with four of their children. After shooting up the car, the Palestinians approached it once it came to a stop and executed the parents. 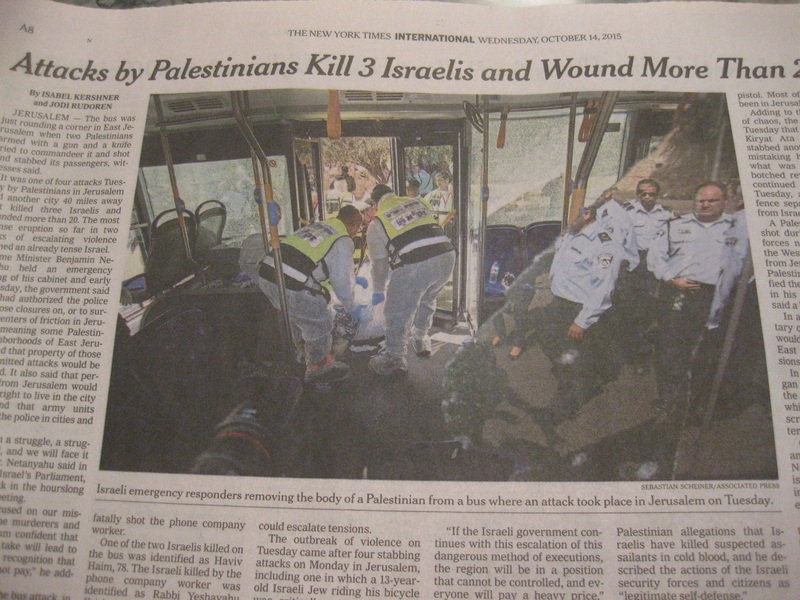 The Times did not post any pictures of the Henkins, the murdered Israelis along the story. If one were to only focus on the pictures and captions, their murders would never have occurred. 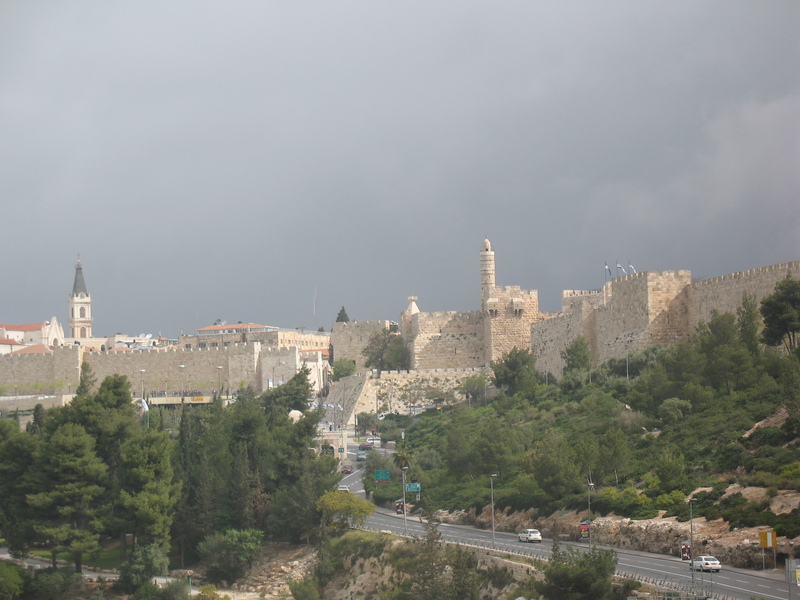 In the following days, the number of Palestinian Arab attacks against Jews continued to grow in frequency. 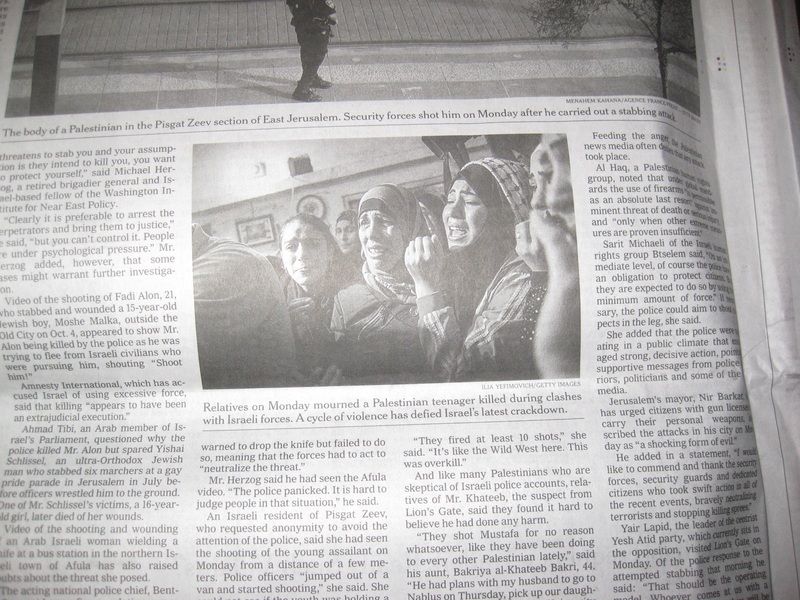 Yet remarkably, the Times pictures showed one story: Palestinians as victims. October 7 Page A4. “At top, the mother of Abdulrahaman Obeidallah, 13, who was killed by Israeli forces, at his funeral on Tuesday near Bethlehem. Above, a Sunday funeral in Jerusalem for Aharon Benita-Bennett, an Israeli killed by a Palestinian.” This was the Times only attempt at providing a “balanced” picture of deaths on both sides. However, there was no attempt to convey that the Palestinian was not shot intentionally, while the Palestinians deliberately were murdering Israelis. October 8 Page A6. “A Palestinian man in a flooded tunnel that was used to smuggle goods between Egypt and the Gaza Strip. 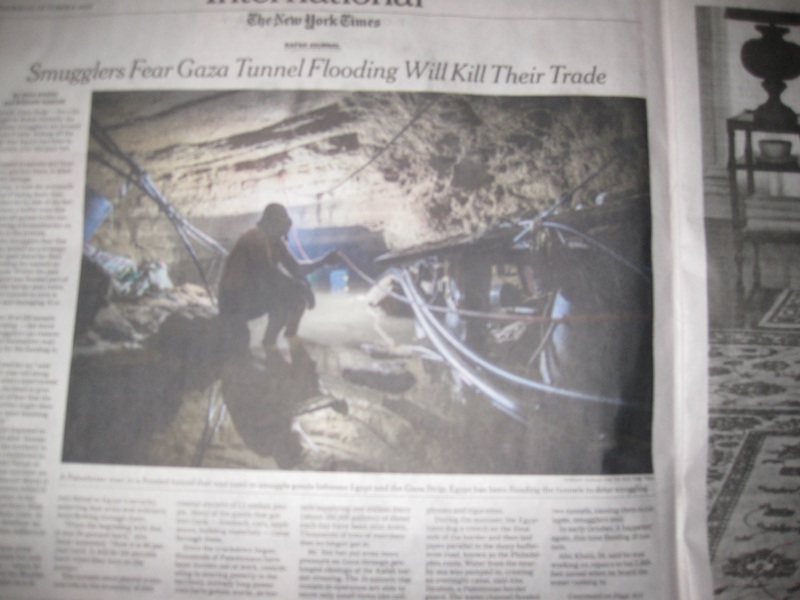 Egypt has been flooding the tunnels to deter smuggling.” The large color picture and caption leads one to feel sorry for the Palestinian. Of course, what was not mentioned was that the “goods” that were being smuggled into the tunnels included weapons to target Israelis and Egyptians. The article continued on page A14 with two black and white pictures. The large picture’s caption “Juma Abu Shaer and his wife Masouma Abu Shaer, at home in Rafah. They fear they may have to leave because of flooding.” Names are given of people living in fear. 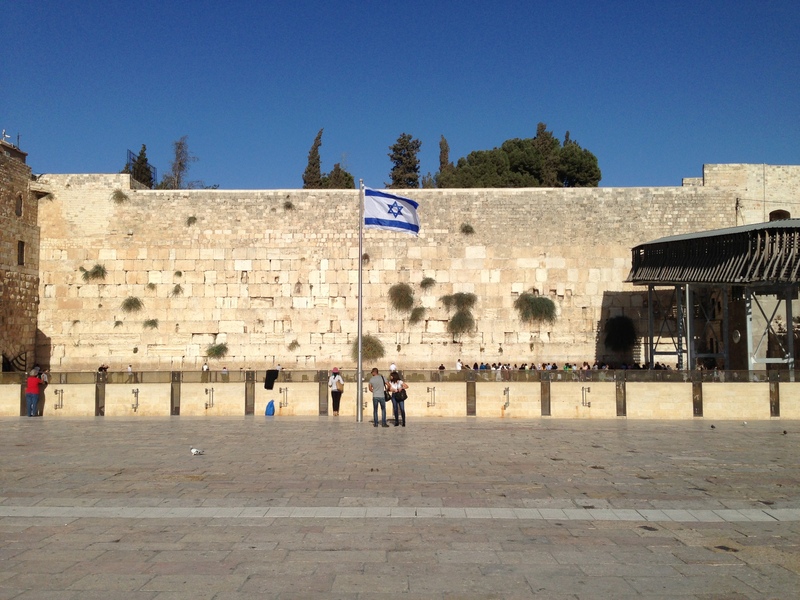 You will not see that for Israelis over the week of terror attacks. The last small photo has a caption “The border between Rafah, in the Gaza Strip, and Egypt on the right. 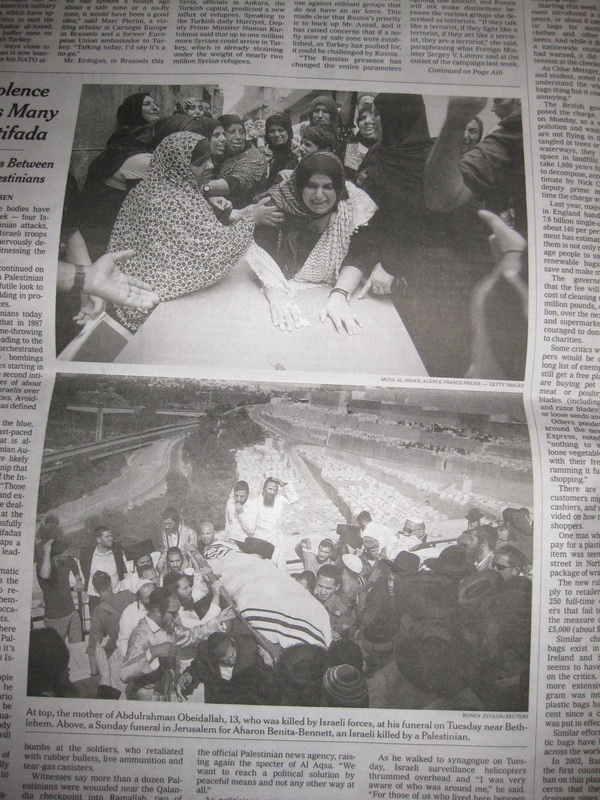 Egypt has flooded part of the nine-mile border area twice.” Such picture and caption confirms that the Times knows that many readers only glance over the articles and rely on the pictures and captions only. 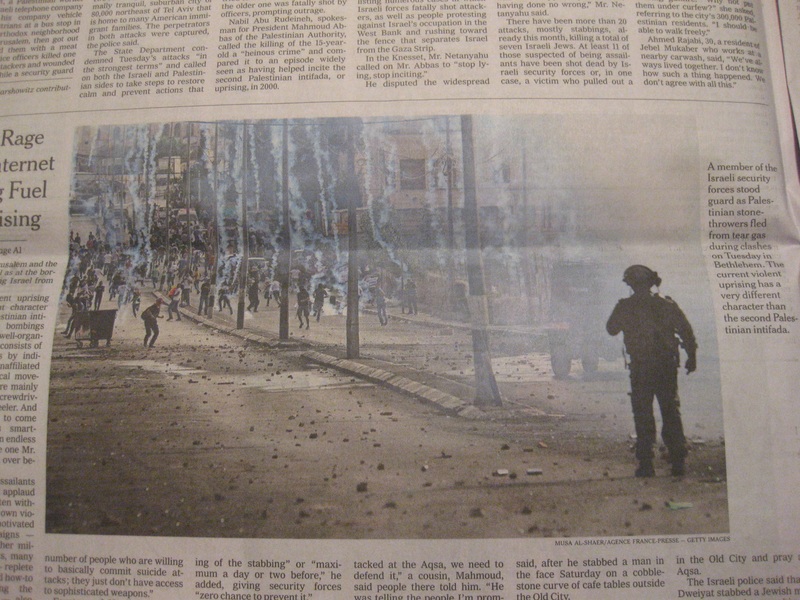 The article about “Unrest Spreads in Israel Despite Tighter Security” which reviewed more Palestinian’s attacking Israelis had no pictures. No Israelis were injured in unprovoked attacks for the news-in-pictures. October 9 Page A14. “An Israeli man looked over the body of a Palestinian assailant who was shot dead after carrying out a stabbing attack on an Israeli soldier and three civilians in Tel Aviv on Thursday.” Another article with larger picture “Palestinian protestors took cover during clashes with Israeli security forces on Thursday in Beit El, West Bank. Disputes over Jerusalem have added to tensions.” The pictures again show dead Palestinians and those under fire. There were no pictures of Israeli civilians who the Palestinian stabbed in unprovoked attacks. The “protestors” are not shown throwing Molotov cocktails and rocks. October 10 Page A4. Small color picture of soldiers over small boys “With security increased, Israeli border police told Palestinians on Friday they could not enter the Noble Sanctuary in Jerusalem’s Old City.” The caption fed a Palestinian narrative that the unrest is from Israeli soldiers keeping innocent Palestinians from praying at their holy site. The image of soldiers with weapons directing small boys add to the drama of the story. There were no pictures of Arabs harassing Jewish visitors on the Temple Mount nor firing firecrackers at the soldiers. Page A8: 2 color pictures. Very large crowd of Palestinians carrying wounded “Palestinians carried a wounded man on Friday in Gaza. It was the first time in the latest outbreak that significant unrest spread to the territory” smaller picture of man throwing stones “A Palestinian protestor hurled some stones at Israeli soldiers on Friday amid clashes on the Israeli border.” Again, Palestinians are shown injured, not Israelis. 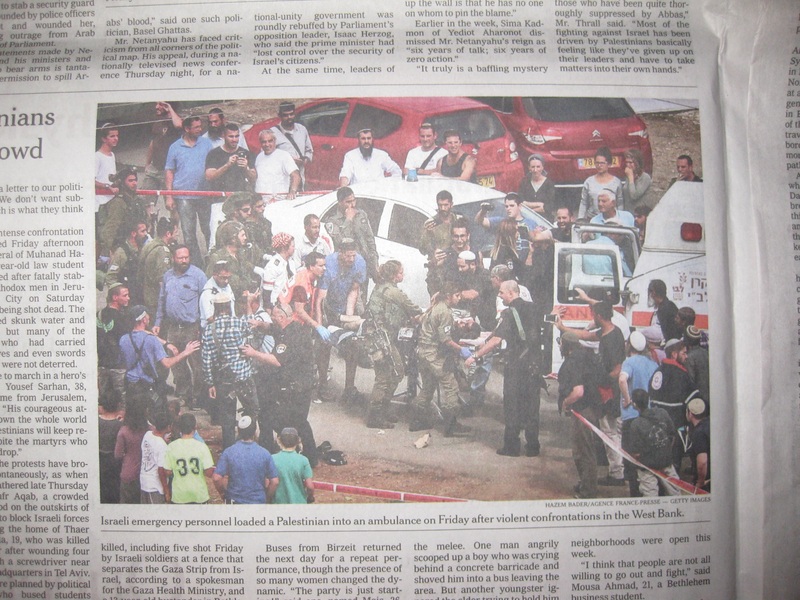 Page A8 another article with medium color picture of Israelis taking wounded away “Israeli emergency personnel loaded a Palestinian into an ambulance on Friday after violent confrontations in the West Bank.” In the third article of the day, the Times once again chose to only show injured Palestinians in attacks that they provoked. None of the injured Israelis is pictured. October 12 Page A6. Black and white of father over dead child “The bodies of Noor Hassan, 30m and Rahaf Hassan, 2, at their funeral. They were killed by an Israeli retaliatory strike in Gaza.” While the caption at least mentioned that the Israeli did a “retaliatory strike” conveying that Palestinians initiated the fight (compared to earlier language of a generic “confrontation”) the pictures are again only of Palestinians hurt in the conflict. Page A8: Another story about the attacks medics pulling someone out of a bus. The caption: “Israeli emergency responders removing the body of a Palestinian from bus where an attack took place in Jerusalem in Tuesday.” No Israeli victims covered from an unprovoked attack by a crazy Arab- note that no blame assigned for the “attack” in the caption. 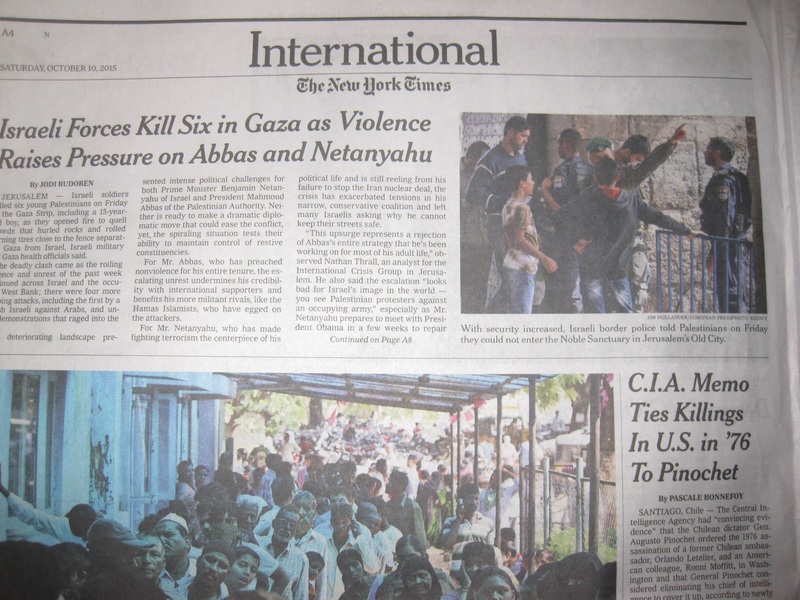 In a week that saw dozens of unprovoked attacks on Israelis, it cannot be an oversight that the New York Times repeatedly chose to show only injured Palestinians. 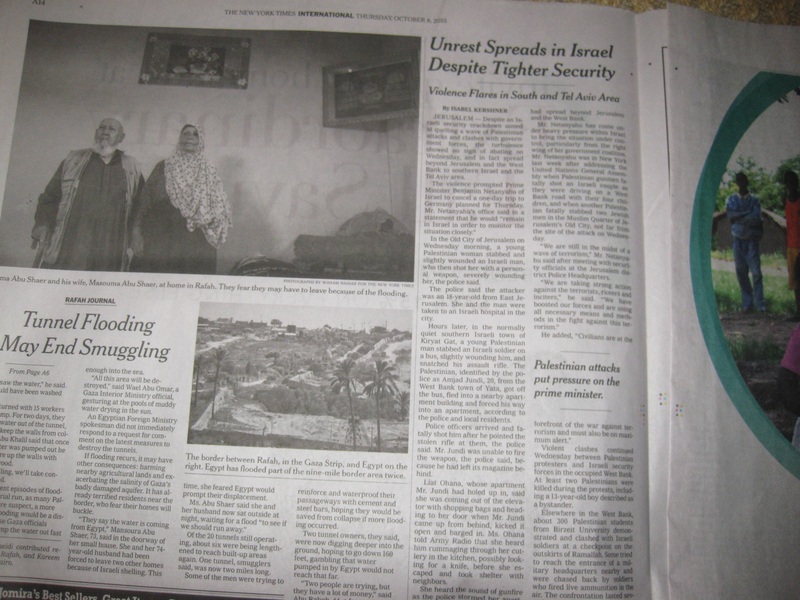 The Times deliberately decided to feed the narrative of Palestinian victimhood. 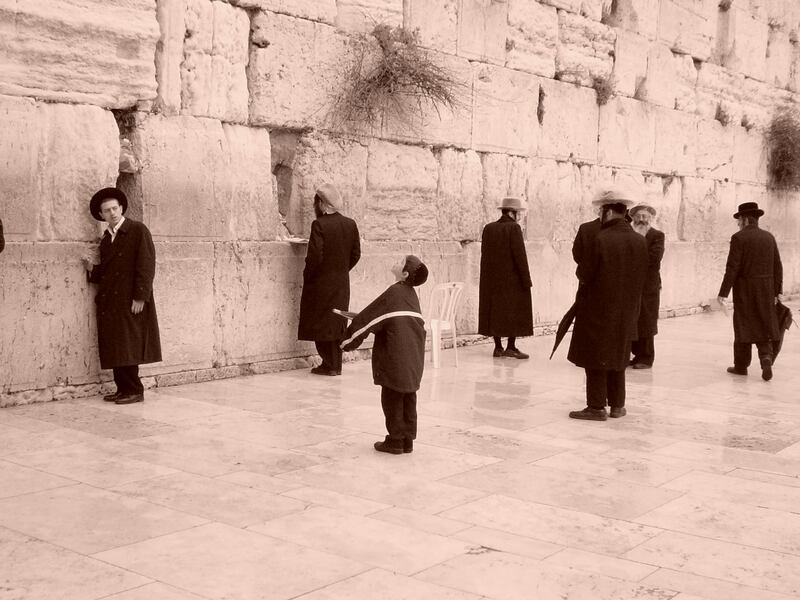 The Israelis were seemingly untouched. 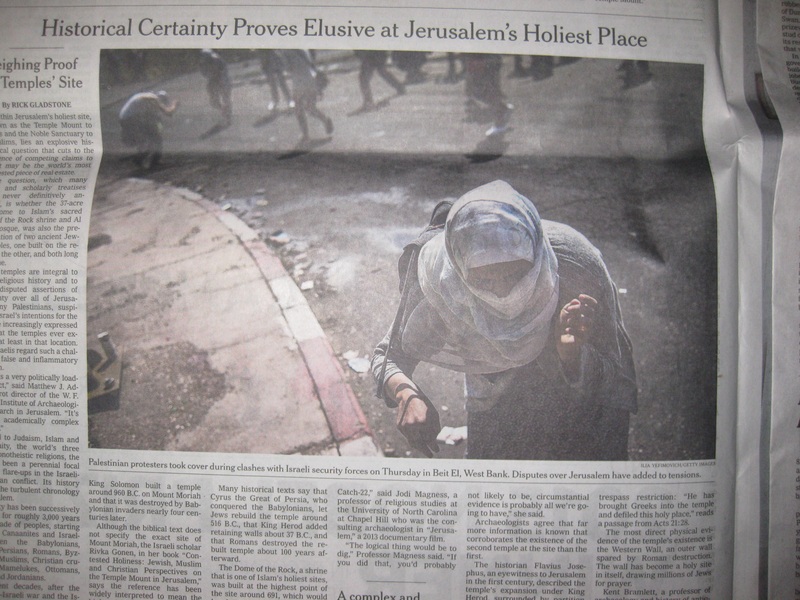 There are some researchers that argue that the media and social media are fanning the flames of the unrest in the Middle East by fanning “misinformation.” If so, the Times’ irresponsible journalism might be viewed as a war crime. 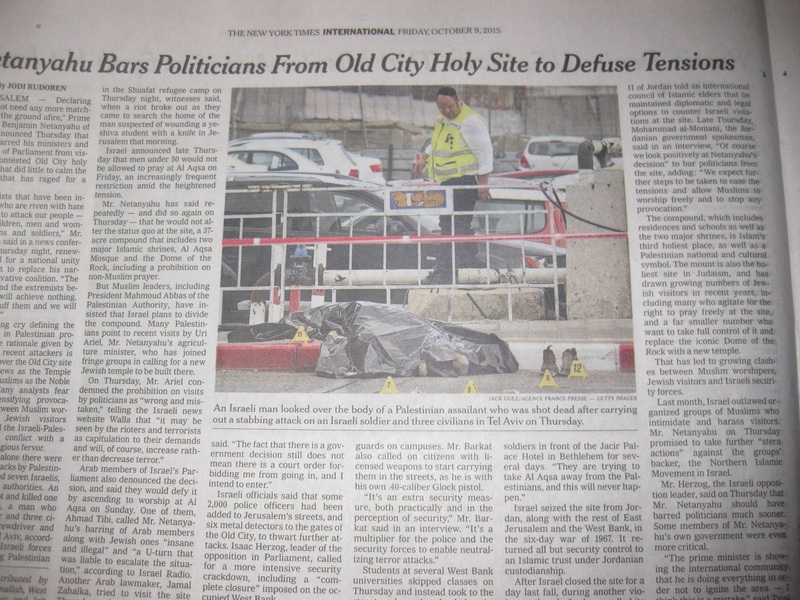 This entry was posted in Israel, New York Times, Palestinians and tagged intifada, Israel, New York Times, Palestinian, terrorism by First.One.Through. Bookmark the permalink.